Isu pokok yang dibangkitkan oleh Ahmad Ismail membabitkan persoalan “menumpang” iaitu rakyat Malaysia keturunan Cina adalah penumpang di negara ini. Beliau menjelaskan bahawa ia merujuk kepada zaman pra-Merdeka. Bagaimanapun, sensitiviti rakyat Malaysia keturunan Cina telah terguris. Secara peribadi, saya tidak setuju dengan apa yang didakwa dikata oleh Ahmad Ismail atas beberapa sebab. Bagi saya, hampir 90 peratus rakyat Malaysia , khususnya di Semenanjung, adalah pendatang dan kita semua sebenarnya menumpang hidup di bumi Allah. Kita bukan pemilik kekal tetapi hanya menumpang. Datuk nenek mantan PM Tun Dr Mahathir Mohamad juga pendatang dari Kerala , India manakala ibu Almarhum Tunku Abdul Rahman berasal dari negeri Siam (Thailand). Hampir semua orang Melayu di sini berasal dari luar Tanah Melayu tetapi diiktiraf sebagai “bangsa Melayu” oleh Perlembagaan Persekutuan. Kita adalah “Melayu mengikut takrifan Perlembagaan” iaitu beragama Islam, mengamalkan adat resam Melayu dan bertutur dalam bahasa Melayu. Malangnya, bahasa Melayu nampaknya dimatikan oleh orang Melayu (UMNO) sendiri apabila dinamakan sebagai bahasa Malaysia . Oleh itu, orang Arab seperti Syed Hamid Albar dan saya, orang Aceh seperti Sanusi Junid, orang India seperti Kader Sheikh Fadzir dan Nor Mohamed Yakcop, orang Bugis seperti Najib, orang Minang seperti Rais Yatim, orang Jawa seperti Mohamad Rahmat dan yang lain seperti dari Madura, Pulau Boyan, Siam, Burma, Yunnan (China) dan selatan Filipina dengan mudah boleh diiktirf sebagai “Melayu”. Syed Imran is an Arab-Malaysian born in Penang, Malaysia, ex-Bernama journalist (1971-1998) and former press secretary to Minister in PM’s Department. Syed Imran provides a Bangsa Malaysia voice in the nation-wide furore which had erupted as a result of Ahmad Ismail’s irresponsible, opportunist and racist reference of Malaysian Chinese as “pendatang” and “penumpang”. I am quite disturbed by the recent events among the UMNO peoples actions and statements about race and Malaysian history. We actually forgot that to begin with - we ALL are immigrants to Malaysia; the only difference is who are earlier and who are later. Historically, the Malays are settling in Malaysia circa 1000 to 1300 (ie about 1000 years ago), and the rest of other races came in from 1600 onwards (few hundred years later). The difference in timing (at least in historical sense) is negligible. The jews occupied Palestine for 5000 years (and hence their claim to the Holy Land), the Arabs occupied Arabia for the same period of time, and so on with other races, when comes to claim of racial supremacy over a piece of land being made. These people not only have claims over the land because of ancestral ownerhsip, but also they were the pillars of the civilizations that was once built by their ancestors on these lands. To say that the Malays have built a great civilization in Malaysia, then we are definitely fooling ourselves; as in actuality the great Malay civilization lies in what is today - the ruins of Angkor Wat! (in Cambodia) (May be those Malays making much fuss about Chinese returning to China, should also be heading to Cambodia, as that is where he actually belongs - historically). In a real sense, Malaysia was built upon layers and layers of immigration - by Malays on various stages and variety - Champa Malays, Thai Malays, Melayu Laut, Indonesian Malays (batak from Medan, Jawa from Java, Riau - from Riau Islands and province, Minang - from Padang), the Arabs (all the Syed, Saids, Sheikhs etc,), the Malabars (Indian mixed with Arabs), the Indian Muslims (which somehow becomes Malays or Mamaks), and the various mixed marriages that happened between these immigrants. This process happens at the same time when Chinese and Indians (tamils, sikhs, singhalese, etc) were also migrating to Malaysia and assimilating into the territory. Therefore, to claim that Malay race (which is already very vaguesly defined if we look at the reality as explained above), has prior and superior claim to this land than other race is totally absurd. What happen was by virtue of Malay Sultanate, this whole thing becomes the issue that needs to be addressed by the British. In another word, the politics was in control of the Malays, and therefore, they want the supremacy of the Malays to continue (politically). When the negotiations took place for the formation of the constitutions (at states and federal levels), the insertion of the Malay race as well as Islam, and the role of the Sultans were enshrined in. That's it. Not because Malays were here earlier than the others. Now that we have gone so far, and we have lived so far, comes the time for us to adapt to the changes that are taking place (and in fact already took place): we have now at least third generations immigrants living today. In any society, when the third generations come forth, it is as good as he/she is a truly citizen of that country, assimilated into the culture of that country, etc..etc. I am actually of the inclination to propose that we should just ammend our constitutions and laws to just simply identify that anyone who is third generation Malaysian should just carry an identity as a 'Malaysian Race' (Bangsa Malaysia), and gradually we drop the Malay, Chinese, Indian race from our identity. I honestly can;t imagine 50 years from now (i.e. two generations down the road), that our grand children still talking to each other as Malay,Chinese,Indian etc. Anyway, the names will continue to reflect the persons origin - because Malays will use Islamic names, Chinese will use mixed Chinese and christian names, and the same for Indians. So there should be no fear of losing your 'identity'. For a start - let us agree that race based parties are 'finished'. It should be the end of UMNO, MCA, and MIC (and hence BN). I would favor PKR - because it is truly being built upon a multic racial lines. (Some would comments that PKR is for Anwar - not true. A party will live longer than the person. Anwar may be instrumental in forming it, but its future will be determined by its members). DAP - is also a good choice, except that it need to come to the enter and gets a more balanced representation by various races (it is still overtly Chinese). PAS - is still a Malay party (which in many ways behaves just like the other side of the coin for UMNO). (as it is actually used against those who are anti government. racist remarks by UMNO/ruling party has always been condoned - Hishamudin keris case is good example. UMNO conventions has been full of racial remarks, etc). GEORGE TOWN: Gerakan should leave the Barisan Nasional ruling coalition because it has only created chaos among the component parties, Bukit Bendera Umno division chief Datuk Ahmad Ismail said. Making the call during a press conference at Menara Umno yesterday, Ahmad said Gerakan acting president Tan Sri Dr Koh Tsu Koon should also be stripped of his post as the state Barisan chairman and the post should be given to the MCA. He said this was because a few Chinese leaders from the Gerakan party including Dr Koh had deliberately taken advantage of the situation and turned it into a racial issue “to hide their own weaknesses”. He said Dr Koh’s leadership had also resulted in the state Barisan failing miserably in the March 8 general election. “He is a leader who is really good at tai chi but I would also like to remind everyone not to forget that the Malays are equally good at silat,” he said. The press conference was called by leaders and representatives of the 13 Umno divisions here led by state Umno liaison committee deputy chairman Datuk Abdul Rashid Abdullah and secretary Datuk Azhar Ibrahim. Ahmad said Dr Koh should apologise not only to the Malays and Mus­lims but also to the Chinese in the country for creating so much tension. “I want Koh and Gerakan to be responsible in case any untoward incidence takes place in our country. “I hope we will not be pushed against the wall, ” he said, as supporters thumped tables and shouted “Hidup Melayu”. Ahmad also said that Dr Koh’s claim that their relationship soured after he (Ahmad) was not re-appointed as a Penang Municipal Councillor in 2006 was untrue and was “another tactic of his to character assassinate me”. He reiterated that he would not apologise for his remark at a ceramah during the Permatang Pauh by-election on Aug 23, and was prepared to face the consequences. Ahmad said that he was happy that the Prime Minister was satisfied with his explanation after the latter chaired the state Umno liaison committee meeting on Sept 6. 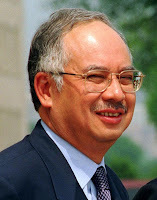 He urged all quarters including Gerakan to stop issuing statements making demands on Barisan and Umno over the issue. At the end of the 40-minute press conference, several supporters brought down from the wall a poster of Dr Koh and tore it to pieces. When contacted later, Ahmad denied any role in the incident. “There were no such instructions. The other division heads and I were in the hall,” he said, adding that the supporters who brought down the picture were not from the Bukit Bendera division. KUALA LUMPUR 4 Sept. – Pejuang kemerdekaan dan Tokoh Wartawan Negara, Tan Sri Abdul Samad Ismail meninggal dunia di Pusat Perubatan Pantai di sini pukul 5.58 petang ini akibat jangkitan paru-paru. Abdul Samad, 84, atau lebih dikenali sebagai Pak Samad dirawat di pusat itu sejak 24 Ogos lalu dan terpaksa dibantu dengan alat bantuan pernafasan. Beliau yang dilahirkan di Singapura pada 18 April 1924, meninggalkan seorang balu, Puan Sri Habibah Hamid dan 10 orang anak termasuk penulis blog dan bekas wartawan, Nuraina dan Maria. Isteri pertamanya, Hamidah Hassan meninggal dunia pada 2 Jun 1990. Menurut anaknya, Nuraina, jenazah Abdul Samad telah dibawa ke rumahnya di No. 2, Lorong 16/7C, Petaling Jaya malam ini dan akan dikebumikan di Tanah Perkuburan Islam Bukit Kiara di sini, selepas sembahyang Jumaat esok. Jelasnya, rawatan dialisis kali kedua yang dilakukan oleh pihak hospital hari ini terpaksa diberhentikan kerana jantung bapanya tidak boleh bertahan. “Sepatutnya rawatan dialisis selama empat jam tetapi diberhentikan selepas sejam rawatan kerana keadaannya yang makin tenat,” jelasnya ketika dihubungi Utusan Malaysia hari ini. Difahamkan, keadaan kesihatan yang tidak menentu itu disebabkan jangkitan paru-paru yang dihadapi bapanya. “Jangkitan itu telah merebak ke organ lain seperti di bahagian buah pinggang,” jelas Nuraina. Allahyarham memulakan kerjayanya bersama Utusan Melayu di Singapura pada 1941 dan tidak lama selepas itu, Abdul Samad meneruskan kariernya dengan dilantik sebagai Penolong Pengarang Warta Malaya (Berita Malai) sebelum dinaikkan pangkat sebagai pengarang akhbar berkenaan. Pada tahun 1946, beliau kembali ke Utusan Melayu sebagai Penolong Pengarang sebelum dilantik sebagai Timbalan Pengarang sehingga 1957. 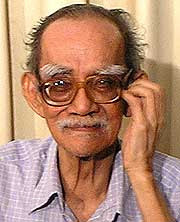 Dalam tempoh 30 tahun mulai 1958, Abdul Samad memegang beberapa jawatan penting termasuk Timbalan Ketua Pengarang Kumpulan dan Penasihat Editorial The New Straits Times Press. Beliau menerima pengiktirafan tertinggi apabila menerima anugerah Tokoh Wartawan Negara pada 19 November 1988 selain anugerah-anugerah kewartawanan lain dari dalam dan luar negara termasuk Anugerah Ramon Magsaysay. Selain statusnya sebagai wartawan terulung, Abdul Samad yang merupakan seorang pejuang kemerdekaan turut menyertai delegasi ke London untuk rundingan mendapatkan kemerdekaan negara pada 1956. Beliau juga bergiat aktif dalam politik tanah air selepas penjajahan Jepun pada 1945 sebagai Presiden Parti Kebangsaan Melayu sebelum menyertai bekas Perdana Menteri Singapura, Lee Kuan Yew menubuhkan Parti Tindakan Rakyat (PAP). Selepas lima tahun, beliau meninggalkan parti itu untuk menjadi Pengerusi Tetap UMNO Singapura.